Slide lever to position seat for maximum comfort. Integrated front and rear bumpers also function as handles to assist lifting. Rubber shock absorbing bushings, non-marking, flat-free tires. seat folds back down and there are adjustable width and height adjustable armrests. Designed to provide maximum flexibility between indoor and outdoor use. Built for easy disassemble. 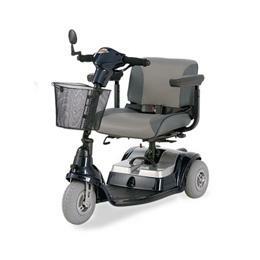 This 3 wheel scooter has a detachable battery pack and has a 360 degree pivoting seat which also slides forward and back for customized fit and maximum comfort.